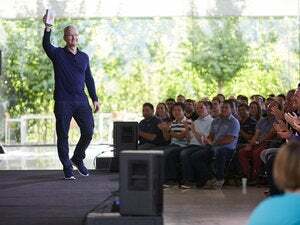 Head hunter: Tim Cook must go! Apple is still extremely successful so the CEO should step down. Makes sense. Apple may be a huge company with billions in profit and revenue but the one thing we all know is that Tim Cook is a terrible CEO who should step down immediately. In October of 2008, Calacanis said Apple would release networked HDTVs. Looking around, the Macalope would say that did not happen. In January of 2010 he tweeted what he said were the full details on the yet-to-be-released iPad. Shortly thereafter he declared it a “prank,” confirming he’s about as good at comedy as predictions. And, 21 months ago in February of 2015, he said Apple would buy Tesla in about 18 months. So, to answer the question above, no, he does not have the room. In criticising both the loss of the ports from the MacBook Pro and headphone socket from the iPhone 7, he said that Apple CEO Tim Cook was “boring, visionless and incompetent” and called for him to leave the company. Keeping ports is exciting, vision-making and competent. Ditching them is the opposite. But ended with a pack of howler monkeys taking over the studio and flinging about things best left unflung, while Calacanis engaged in a “Yo mama” fight with a 4-year-old orphan whose only retort was to continually sob “My mother is dead!” as Leo Laporte struggled to regain order. OK, only some of that happened. Tim Cook is bland and visionless but, eh, at the same time he’s also Benito Mussolini. No, this isn’t a wild, rant from someone who’s been making nonsensical arguments against Apple for years. Whatever gave you that idea? Suggesting that good products do not force people to make decisions is how you keep floppy drives and VGA ports forever. But forget about that. ENGAGE FULL RAGE-O-TRON! Never mind that you can now power the MacBook Pro from any port. Never mind the portability improvement of a lighter professional laptop. HANG ON TO THOSE LEGACY PORTS FOR DEAR LIFE! Calacanis went on to compare his view of Cook with Steve Jobs, seemingly forgetting that Steve hand-picked his successor. Still, it’s true that Calacanis always had nothing but nice things to say about Jobs. Steve Jobs is on the cusp of devolving from the visionary radical we all love to a sad, old hypocrite and control freak–a sellout of epic proportions. This started on a comment by LaPorte about Apple dropping the price of adapters. Which, the Macalope agrees, they should have done when the new MacBook Pro was announced. It’s a port transition period, you should make it easy for your customers. Let’s just say the Macalope will stick with Cook’s.